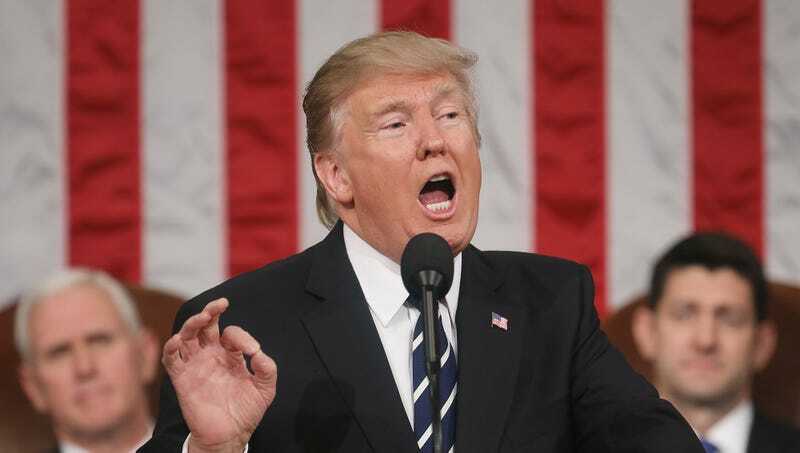 WASHINGTON—Declaring during his first State of the Union address that the United States “must restore the rule of law,” President Trump took a hard line on domestic security issues Tuesday night as members of his staff handed out loaded revolvers to everyone in attendance. “Our way of life is being threatened by violent criminals and all these people pouring into our country and doing these terrible things,” the president said as staffers carried in wicker baskets full of Colt .45s, .357 Magnums, and Ruger GP100s and distributed them to the 115th Congress, the Supreme Court, the Cabinet, and various guests, all of whom began inspecting and, in some cases cocking, the weapons. “It’s long past time we did our jobs and liberated ourselves from the thugs overrunning our cities and towns. Let’s throw these animals out of America once and for all—starting right now.” Though Trump’s words were met with thunderous applause and celebratory small-arms fire, sources confirmed plans to begin administering justice immediately were delayed after it was discovered Senate Majority Leader Mitch McConnell had accidentally shot his entire face off.